TUCSON, Ariz., Nov. 7, 2017 /PRNewswire/ -- Roche (SIX: RO, ROG; OTCQX:RHHBY) today announced it has obtained US Food and Drug Administration (FDA) approval for the VENTANA ALK (D5F3) CDx Assay as a companion diagnostic to identify ALK-positive non-small cell lung cancer (NSCLC) patients eligible for treatment with the Roche medicine ALECENSA® (alectinib). The VENTANA ALK (D5F3) CDx Assay is the only test FDA-approved as a companion diagnostic for ALECENSA. "We are very excited about the companion diagnostic label expansion for the ALK (D5F3) assay. This immunohistochemistry assay will deliver critical information on treatment options for non-small cell lung cancer patients," said Ann Costello, Head of Roche Tissue Diagnostics. "The ability to identify ALK-positive patients very quickly with a simple IHC test ensures that more patients can benefit from targeted therapy." VENTANA ALK (D5F3) CDx Assay is intended for the qualitative detection of the anaplastic lymphoma kinase (ALK) protein in formalin-fixed, paraffin-embedded (FFPE) non-small cell lung carcinoma (NSCLC) tissue stained with a BenchMark XT or BenchMark ULTRA automated staining instrument. It is indicated as an aid in identifying patients eligible for treatment with XALKORI® (crizotinib), ZYKADIA® (ceritinib) or ALECENSA® (alectinib). This product is intended for in vitro diagnostic (IVD) use. For more information, visit ALKIHC.com. For more information on ALECENSA (alectinib), visit www.alecensa.com. Roche is a global pioneer in pharmaceuticals and diagnostics focused on advancing science to improve people's lives. The combined strengths of pharmaceuticals and diagnostics under one roof have made Roche the leader in personalised healthcare ? a strategy that aims to fit the right treatment to each patient in the best way possible. VENTANA and BENCHMARK are trademarks of Roche. Other product names and trademarks are the property of their respective owners. 1This product is intended for in vitro diagnostic (IVD) use. Approximately 60 percent of lung cancer diagnoses in the United States are made when the disease is in the advanced stages. Approximately 5 percent of people with NSCLC in the United States are ALK positive. ALK-positive NSCLC is often found in younger people who have a light or non-smoking history. 3van der Wekken AJ, Pelgrim R, 't Hart N, Werner N, Mastik MF, et al. Dichotomous. ALK-IHC is a better predictor for ALK inhibition outcome than traditional ALK-FISH in advanced non-small cell lung cancer. Clinical Cancer Research, 2017, 23(15):4251-4258. doi: 10.1158/1078-0432.CCR-16-1631. 4 Zhou J, Zhao J, Sun K, Wang B, Wang L, et al. Accurate and economical detection of ALK positive lung Adenocarcinoma with semiquantitative immunohistochemical screening. PLoS ONE 2014, 9(3): e92828.doi:10.1371/journal.pone.0092828. 5Shan L, Lian F, Guo L, Yang X, Ying J, et al. Combination of conventional immunohistochemistry and qRT-PCR to detect ALK rearrangement. Diagnostic Pathology 2014, 9:3.doi:10.1186/1746-1596-9-3. 6Ying J, Guo L, Qiu T, Shan L, Ling Y, et al. Diagnostic value of a novel fully automated immunochemistry assay for detection of ALK rearrangement in primary lung adenocarcinoma. Annals of Oncology, 2013, 24(10):2589-2593; doi:10.1093/annonc/mdt295. 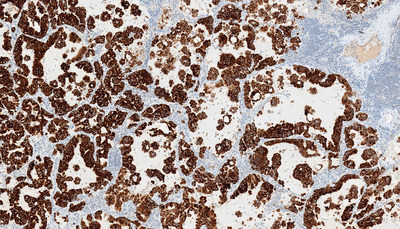 7The approved ALK (D5F3) Assay stained with OptiView DAB Detection and Amp is a 4 1/2-hour, fully automated test to be stained with all other routine IHC testing for same-day results and to meet current CAP/IASLC/AMP guidelines for testing patients with lung cancer; Lindeman NI, Cagle PT, Beasley MB, Chitale DA, Dacic S, et al. Molecular testing guideline for selection of lung cancer patients for EGFR and ALK tyrosine kinase inhibitors: guideline from the College of American Pathologists, International Association for the Study of Lung Cancer, and Association for Molecular Pathology. Journal of Thoracic Oncology 2013; 8(7):823?859. doi: 10.1097/JTO.0b013e318290868f.